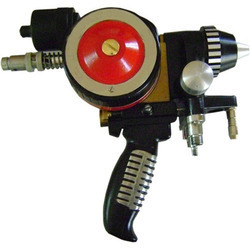 Flame type Metal Spray Gun sprays pure or alloyed metal such as Zinc, Aluminium, Steel, Brass, in wire form by using Oxygen-Acetylene/L.P.G. gases flame and atomized by a blast of compressed Air. Spraying of metal to prevent corrosion against water, atmospheric & chemicals. We are counted amongst reckoned names in the industry, committed towards trading a broad gamut of Color Spray Gun. 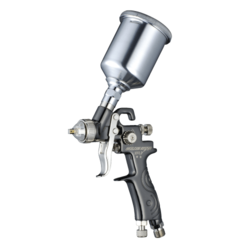 We are engaged in offering Metal Spray Gun. Starting range from 2200 Rs. Backed by the profound experience of the industry, we have been able to offer a range of Metallic Water Spray Guns. These petite adjustable products can be availed by the customers in two patterns as per their requirements. All our products are available in variegated sizes and specifications, in accordance with their needs. Gun Distance From Work Piece: 6""
Flame type Metal Spray Gun sprays pure or alloyed metal such as Zinc, Al, Steel, Brass, in wire form by using Oxygen-Acetylene/L.P.G. gases flame and atomized by a blast of compressed Air. Spraying of metal to prevent corrosion against water, atmospheric & chemicals.